As doctors get better at treating diseases, engineers continue to discover new solutions to medical issues that were previously thought to be impossible to solve. College of Engineering seniors were no different at this year’s Capstone Design Expo, with many of the teams concentrating their efforts on preventing, diagnosing, and treating diseases and health concerns. Teams from nearly every school found ways to improve the well-being of people all over the world. Students from the School of Electrical and Computer Engineering created a device that detects instances of opioid overdose. A team from the Woodruff School of Mechanical Engineering designed and constructed a prototype that scans the skin of a patient’s arm to diagnose lymphedema. Interdisciplinary groups did everything from creating a system that provides a modern approach to quitting nicotine, to heating orthopedic implants. At the Capstone Design Expo, 153 teams of graduating students got the chance to display prototypes of their ideas, which are representative of their years of engineering and design learning done while at Georgia Tech. They were judged by more than 150 experts and professionals from around the world, who scored each project and named a winner in each category. 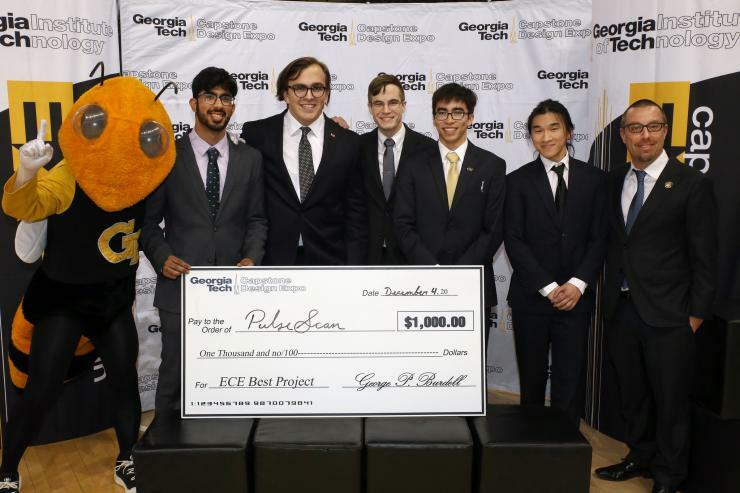 This fall, the winner from the School of Electrical and Computer Engineering (ECE) was PulseScan. PulseScan is an original student idea to develop an electrocardiogram (ECG) wearable that will track a user’s ECG signals and monitor them from one’s phone or laptop, warning of short-term and long-term heart risk while also providing information on physical fitness. It consists of two lightweight wristbands worn on each wrists. Read more about the Fall 2018 Capstone Design Expo.